Look toward the hilly Manayunk landscape while driving on I-76, and St. John the Baptist Church with its jutting steeple owns the vicinity. The Philadelphia neighborhood bustles with bikers and young couples walking the street beside the towering structure. A black folder emblazoned with Temple University Fox School of Business in hand, Richard van Fossen, who works at the university, eased his feet along Cresson Street in the shadow of the church and split his attention between speaking and walking. His gait came to a halt at a faded obelisk honoring Bernard McCane, whose donation in the 19th century made building St. John’s possible. He looked at it in awe before detailing the need to raise money in the millions to salvage St. John’s. The steeple, like the parish, tilts in defiance as it erodes, yet van Fossen believes it is not beyond repair. St. John’s stands as a solid mass made of stone, deteriorating and awaiting revival. The stone was solid in its past but is gradually crumbling in the present. Now more than a century after it was built, the building needs major repairs to sustain its future. 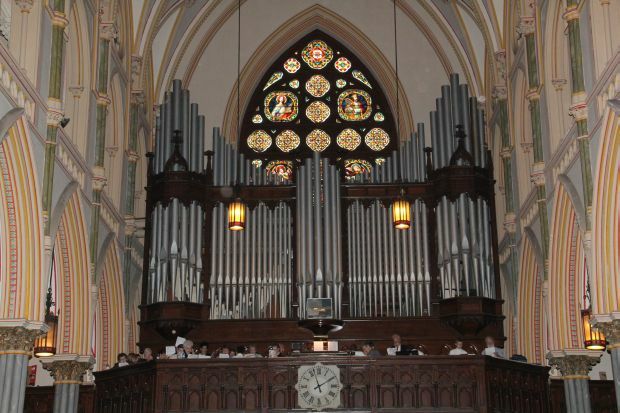 Van Fossen made his way to the Manayunk Arts Festival last summer in the hopes of finding a portrait or picture of St. John’s, otherwise known as Manayunk’s Cathedral, a love of his life. He doesn’t know what the future will hold but seems to cherish an inner hope rising against the possible fate of the church. St. John the Baptist could use another Bernard McCane. The spires and buttresses of the 120-year-old sandstone church are visibly twisting in their deterioration, along with other masonry problems. According to a joint report issued last April by the Vitetta architectural firm and MacIntosh engineering firm, repairs are needed on the rotated and cracked buttresses and their spires. The imposing bell tower, visible from afar, needs work to replace cracked and missing stones, and repointing to replace missing mortar. Other repair items include roofing and interior plaster, both of which have experienced water damage. As with any building, water infiltration is a major concern. When it seeps under aged or missed roof tiles or beneath metal flashing, it erodes the mortar of the surrounding stone and weakens the masonry at that point. If left unchecked the water also disintegrates plaster and wooden support beams. Although the study noted the interior heavy timber trusses and most of the slate roof were in good condition, some slates were missing and the rainwater conductors on the masonry walls were in poor condition, needing replacement. This is leading to some deterioration of the plaster. And while St. John’s magnificent stained glass windows were not part of the assessment, the report noted some panes were missing and several windows did not close properly. The report categorized certain items as “urgent,” including repairs to the roof and masonry buttresses of the church totaling almost $430,000. Repairs to the bell tower would run another $475,000, including the cost of scaffolding to accommodate the presence of high-tension electrical lines adjacent to the church. The report recommends many other items including especially repointing of foundation masonry to be completed in a projected one- to three-year time frame. The total repair cost for the church is estimated at more than $3.5 million. “The church is a mainstay in Manayunk,” said Speedy Morris, a staple in the Manayunk community and Friends of St. John the Baptist Committee co-chairman with van Fossen. His voice trailed and strengthened in intermittent and softened statements as he spoke about the church. “It should never close,” Morris said. A grassroots campaign in the parish is attempting to save the church building. Dennis Meyers spent 54 years in the parish after his baptism at St. John’s. He was also the CYO youth director for 35 years. “I hope to be wheeled down the aisle when I die,” Meyers said. He prays a big donor will come along to deliver a bulk or all of the money, but in a blue-collar town, the odds may not be in favor of it. Msgr. Kevin Lawrence, St. John’s pastor, said the pledge process is very formal. The Friends of St. John the Baptist recently mailed 1,500 fundraising letters to parish alumni. The parish hopes to raise $450,000 by June 30, 2015 in Phase I of the capital campaign and finish the urgent repairs next summer. In total, the parish wants to raise $2 million in three years. “You don’t know who’s out there until you ask,” Msgr. Lawrence said of potential donors. Instead of making the weekly church offering part of the capital campaign, the parish needs an additional sum from individuals to supplement the amount already given at Sunday Masses. Despite the daunting challenge of raising money to repair the church, St. John the Baptist Parish gave the project a vote of confidence last summer. In 2012 St. John’s merged with St. Mary of the Assumption (established for German-speaking Catholics) and St. Josaphat (Polish) at St. John’s. A task force of parishioners studied the still-open question of which of the three churches should be the main worship site for parishioners. They recommended to Msgr. Lawrence that St. John’s should be that site because, if it can be saved, it holds the greatest potential for future sustainability for the parish. 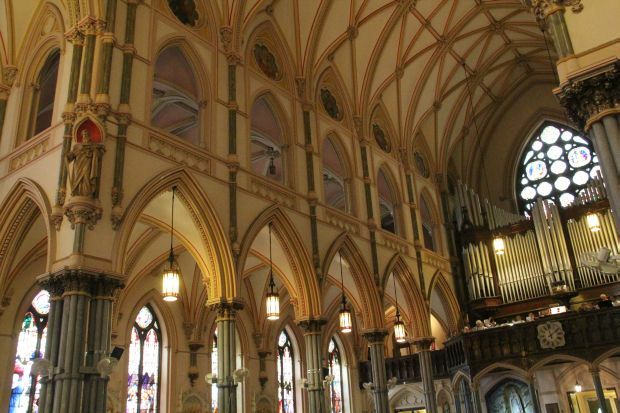 It is also the largest church of the three and maintains historic significance, once hosting a visit by St. John Neumann. Meyers said the task force focused on sustaining the parish instead of just preserving the building, a sentiment echoed by Msgr. Lawrence. With a small number of members from St. Mary and St. Josaphat coming to St. John’s for Masses, Meyers said the parish wouldn’t sustain itself if one of the other two churches became the parish’s main worship site, not with a majority of parishioners from the original St. John’s. Msgr. Lawrence took the task force’s recommendation to the parish pastoral and finance councils, which agreed with it. He accepted the decision and made the announcement Aug. 24 at weekend Masses and in the church bulletin. St. Mary and St. Josaphat remain worship sites of St. John’s at this time. 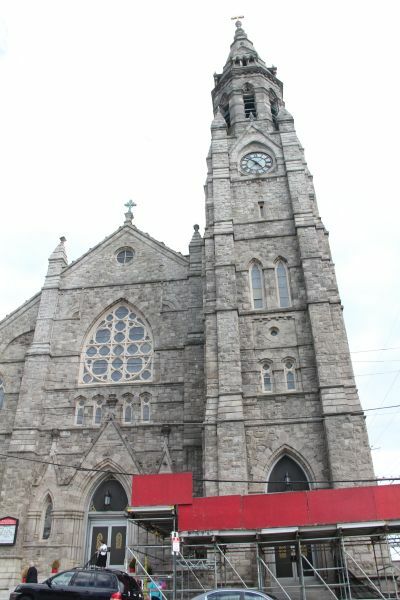 Manayunk’s other Catholic parish, Holy Family, remains on its hilltop site at the opposite end of town, itself the product of a merger with St. Lucy (Italian) in 2012. Email freelance writer Brendan Monahan at bmonahan16@gmail.com. If they had started the repairs years ago when they were minor the expense would not be so great but the AD used money for other Stupid projects that didn’t bring 1 soul into the Church long term. A public example, Mayor NUTTER, he became Catholic upon entering Catholic School(Transie) and got reduced /free tuition and than went to St. Joe’s prep. After school he leaves the Church and goes back to his family’s church. Do you every think he ever was CATHOLIC ? Of course not!!! I saw this many times while teaching Catholic grade school. People than were looking for alternatives to the public schools and the AD years ago should have made many schools Charter and made some money to save our buildings. Even today you have mission schools that are taking money from us. I know Faith and the Future is paying but it is from the same pants just different pockets!!! GET A CLUE!!!!! The AD doesn’t control the tuition policies/fees of parish elementary schools. K-8 schools are run by the parishes, not the AD. Even the “regional” ones are run my the pastors of the parishes the regional school covers. Only the diocesan high schools are directly controlled by the AD. And St. Joe’s Prep is a private Catholic school (Jesuit), not connected with the AD at all. The real problem is that the Catholic schools do not do a good job with what they are SUPOSED to do. Evangelize the students to be come good Catholics. If the teachers and staff at Transfiguration of Our Lord Catholic Elementary School were really good at their job, Nutter would have become Catholic. But instead the schools often “respect” that students are attending from different religions/denominations. This is where the schools fail. And the private ones fail even more because they have the students with money, who could donate to the church. But lots of them are cafeteria Catholics or non-Catholics too. I hope the parishioners of St . John’s better luck than what the parishioners of St. Lauretius parish encountered from the Archdiocese….but the truth is that the fate of St. John the Baptist parish has already been decided by the Archdiocese and there is nothing in this creation that will change that decision!!! !